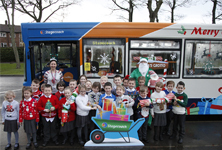 Families in Hartlepool and Teesside can enjoy a cheaper day out around the region this Christmas as Stagecoach North East has brought back its popular bus travel for 10p for the under-16s. Pupils at two Sunderland schools were given an early Christmas present when Green Santa dropped in and presented them with a cheque for £250 after winning a north east competition. Three keen young engineers have taken the first step towards a career in engineering after being selected to join a four-year apprenticeship with Stagecoach North East.